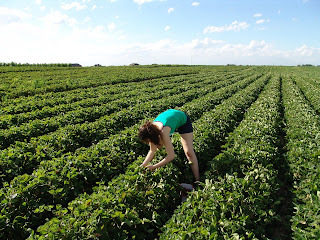 This past summer Johnny and I picked strawberries and raspberries at a local farm. We quickly realized that there were too many strawberries to just snack on, so I started looking around for recipes to use them up. There were two or three failed baking attempts. Variations of strawberry bread, strawberry pie, and strawberry scones. They all turned out really watery, took a lot longer than the specified cooking time, and overall just soggy and a big mess. So, when the BSI was named as strawberry, I knew I'd be staying away from a baked dessert - which left a refrigerated version! Mmm, custards and cheesecakes, oh how I love you! Johnny and I finally settled on this strawberry banana cream pie because all of the flavors and components are delicious ones we love, and it had enough steps that we could divide it up and make it together. While I was doing that, Johnny started making the cream, or custard filling for the pie. Combine sugar, corn starch and salt in a medium sauce pan. In a small bowl, mix egg yolks and milk. Slowly incorporate the wet ingredients into the dry ingredients, stirring to make a smooth paste, and eventually adding all. Cook over medium heat, stirring constantly until mixture begins to boil. Boil at 1 minute, still stirring constantly. Remove from heat and stir in vanilla. Set pan in a bowl of ice water and continue stirring to cool. This was a lot of stirring and kept him occupied, so I got to work on the strawberries and bananas. I took about 2 cups of strawberries and 1 large banana and cut them up to go in the pie. By now, the pie crust had finished, so we took that out to cool. Layer the strawberries on the bottom of the crust, then spoon over half of the filling and spread out. Next, add a layer of ba nanas, and finally top with the remaining filling mixture. For garnish, decorate the top with a couple strawberry slices. Let cool in the fridge for a few hours, until the filling firms up - almost like a custard, or flan. Then, cut into slices, serve and enjoy! That turned out really good!!! Great job! That's my kind of pie. YUM! That pie looks so good! I am really looking forward to strawberry season. I love that combo. It turned out great! Good job!